Posh full-back Michael Smith (blue) was watched by Northern Ireland manager Michael O'Neill in the FA Cup tie against Luton. 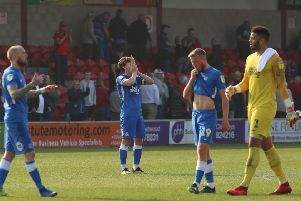 Peterborough United manager Graham Westley believes players in his gifted squad shouldn’t rule out a shock appearance at the 2016 Euros in France. Northern Ireland manager Michael O’Neill watched Posh beat Luton 2-0 in the second round of the FA Cup at the ABAX Stadium on Sunday (December 6). He was believed to be watching Posh full-back Michael Smith and striker Conor Washington. Washington, who was born in Kent, is eligible to play for Northern Ireland because of an Irish-born relative. Outstanding Posh midfielder Chris Forrester has also been tipped to make a late bid for Martin O’Neill’s Irish Euros squad. Westley said: “Michael O’Neill was at the game against Luton, but I have yet to speak to him. I will catch up with him later this week. “I assume he was there to watch Michael Smith and Conor Washington and I assume he would have been impressed as both of them played very well. “What you tend to find is managers will understandably keep faith with the players who performed throughout the qualifying rounds. That loyalty is commendable. “But you never know what’s round the corner in football. My players certainly shouldn’t give up all hope of getting a call-up. Neither Smith, Washington or Forrester have made senior international appearances. Smith and Forrester have made under 23 and under 21 appearances respectively for their countries. the draw for the Euros 2016 Finals takes place on Saturday (December 12). *Posh midfielder Jermaine Anderson is today (December 8) due to have a scan on a suspected calf injury. Anderson limped out of the FA Cup win over Luton after just five minutes.